Nick Viall Age: 36 Partner: Peta Murgatroyd Viall is a former contestant on "The Bachelor," and he's probably hoping he's not sent home heartbroken... again. Erika Jayne Age: 45 Partner: Gleb Savchenko Jayne has nine No. 1 hits on the Dance Club song chart as of 2016. She may have the moves, but will she get the votes? 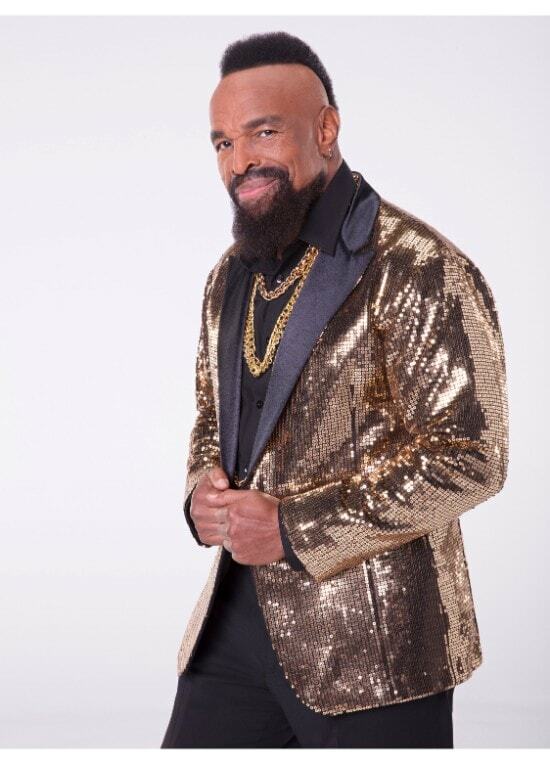 Mr. T Age: 64 Partner: Kym Herjavec Judging from his break dancing moves, we pity the fool who has to dance with Mr. T.
Bonner Bolton Age: 29 Partner: Sharna Burgess As a professional bull rider and country fashion icon, Bolton should have the dexterity to dance. But his popularity among fans may not pan out. Charo Age: 65 Partner: Keo Motsepe Charo has a long history as a flamenco dancer. Cuchi-Cuchi! Rashad Jennings Age: 31 Partner: Emma Slater This veteran NFL running back most recently played for the New York Giants. But will he show that same fancy footwork on the dance floor? Chris Kattan Age: 46 Partner: Witney Carson He has the head-bobbing down pat. The "SNL" alum has a chance if he gets back to his "Night at the Roxybury" roots. Heather Morris Age: 30 Partner: Maksim Cherkovskiy This "Glee" actress, singer and dancer has a jazz dance background and was even a backup dancer for Beyonce. David Ross Age: 39 Partner: Lindsay Arnold The now-retired "Grampa Rossy" just won the World Series as a catcher for the Chicago Cubs. His dance moves on "SNL" weren't the best, but Cub fans will probably be voting for him in droves. Nancy Kerrigan Age: 47 Partner: Artem Chigventsev Kerrigan is a world champion and Olympian figure skater. And she'll probably still dazzle sans skates. Simone Biles Age: 19 Partner: Sasha Farber She's one of the best, most athletic Olympian gymnasts in history and a front-runner to win it all.